Rep. John Murtha, D-Pennsylvania, recently underwent laparoscopic surgery to remove his gallbladder. (CNN) -- Rep. John Murtha of Pennsylvania, a longtime fixture on the House subcommittee that oversees Pentagon spending, died after complications from gallbladder surgery, according to his office. He was 77. The Democratic congressman recently underwent scheduled laparoscopic surgery at National Naval Medical Center in Bethesda, Maryland, to remove his gallbladder. The procedure was "routine minimally invasive surgery," but doctors "hit his intestines," a source close to the late congressman told CNN. Murtha was initially hospitalized in December and had to postpone a hearing with Defense Secretary Robert Gates on the administration's strategy in Afghanistan. The congressman returned to work after a few days in the hospital and helped oversee final passage of the 2010 defense appropriations bill. The National Naval Medical Center issued a statement saying Murtha was admitted January 28 for surgery, but declined to reveal additional details, citing his family's request for privacy and federal privacy laws. In a written statement, Ray Mabus, secretary of the Navy, and Adm. Gary Roughead, chief of naval operations, expressed sympathy and condolences. Murtha had a "tough-as-nails reputation" and a "passion for service," President Obama said in a written statement. He was "a steadfast advocate for the people of Pennsylvania" and "a respected voice on issues of national security," Obama said. House Speaker Nancy Pelosi, a longtime ally of Murtha's, said in a statement that he always put "the troops and their families first." Murtha was "incredibly effective in his service in the House," said Wisconsin Rep. David Obey, chairman of the Appropriations Committee. "Every person who serves in the military has lost an advocate and a good friend."  Represented Pennsylvania's 12th district since 1974.  Became a vocal critic of the war in Iraq, called for a "change in direction."  Was the first Vietnam War combat veteran elected to Congress.  Chairman of the Defense Subcommittee of the House Committee on Appropriations.  Known as one of the "kings of pork" on Capitol Hill. 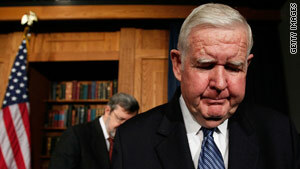 Murtha "will be missed," said House Minority Leader John Boehner, R-Ohio. "The House of Representatives has lost one of its own." Murtha had represented Pennsylvania's 12th Congressional District since 1974, making him the chamber's eighth most senior member. According to his biography on the House of Representatives Web site, Murtha was the first Vietnam War combat veteran elected to Congress. He was considered one of "the kings of pork" on Capitol Hill by taxpayer watchdog groups for requesting tens of millions of dollars in earmarks. On his House Web site, Murtha strongly defended earmarks, saying, "I believe that elected representatives of the people understand their constituents and districts best." Supporters said his efforts helped bring thousands of jobs to western Pennsylvania. Other controversies dogged Murtha's career. Critics alleged that he steered Pentagon contracts to businesses that hired his brother as a lobbyist, but Murtha insisted that his brother was treated like everyone else. Murtha also turned up in the FBI's Abscam investigation in 1980 when undercover agents offered bribes to several members of Congress. Murtha was videotaped turning down a bribe, saying he wasn't interested "at this point." He was not charged. Murtha came under fire during the 2008 election campaign for saying that part of his state was a "racist area" where constituents would not vote for Obama because he was black. He later apologized and said, "While we cannot deny that race is a factor in this election, I believe we've been able to look beyond race these past few months." Murtha won 58 percent of the vote in 2008, his last re-election; Republican presidential candidate Sen. John McCain won the district by less than 1,000 votes. Murtha, a former Marine, also earned a reputation as one of Congress's loudest anti-war voices. He initially supported the 2003 invasion of Iraq, but he stunned much of Washington when he called for a swift U.S. pullout in November 2005, saying, "U.S. and coalition troops have done all they can. ... It's time for a change in direction." In 2006, Murtha seemed on track to become the House Majority leader, but he lost to Rep. Steny Hoyer of Maryland. Murtha said he was subject to "swift boat-style attacks" on his ethics record, blasting critics who raised concerns about "unfounded allegations that occurred 26 years ago." Born June 17, 1932, in West Virginia, Murtha moved with his family to Pennsylvania as a child. Before joining the House, he was in the Pennsylvania state Legislature. He also served 37 years in the Marines and Marine Corps Reserves. He retired from the Reserves in 1990 and received the Navy Distinguished Service Medal. Murtha attended Washington and Jefferson College, but dropped out in 1952 to enlist in the Marines. He later graduated from the University of Pittsburgh. He is survived by his wife, Joyce, and three children. CNN's Kristi Keck, Elizabeth Cohen, Sabriya Rice and Rebecca Sinderbrand contributed to this report.